Even though we weren't having a big get together for the Olympics Opening Ceremonies this year, we still wanted a special cocktail to enjoy while watching. Well, I was watching "The Monarchy at Work" on PBS and the bartender at Buckingham Palace gave us the answer. We would drink what the Queen drinks, Dubonnet and Gin. Now, we aren't drinking out of special engraved crystal cocktail glases, but beyond that we tried to stick to the drink as was told by said bartender. Remove any pits from the lemon slice (the Queen does not spit out lemon pits). Put the slice at the bottom of the glass. Top with two ice cubes (the most perfect cubes in the freezer). Add gin and Dubonnet. Mix. 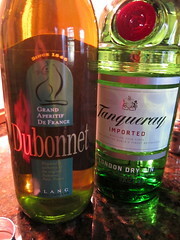 Dubonnet is a French aperitif (some stores keep it with the vermouth). It has an herbal flavor to it which blends well with the juniper flavor of the gin. I found it an easy drinker, but a strong little cocktail, just one went to my head. Bravo, to Betty for drinking something a little more interesting then a glass of sherry. There do seem to be a lot of online drug spammers out there at the moment. I'm also getting knock-off handbags and naked celebrities, which is appalling. I am fascinated to try this, but it might have to be in a bar - I'm a bit unwilling to buy a bottle of Dubonnet in case I don't like it. Foodycat - Luckily Dubonnet was quite reasonably priced, I think we paid 12.99 USD for it. Certainly, made it easier to try it out. It would be totally cool to see the Queen spit a pit though! Sounds very refreshing. I am loving gin this summer! Have never tried Dubonnet. This is a new drink to me, how interesting! A great one to sip during the games. Great recipe! 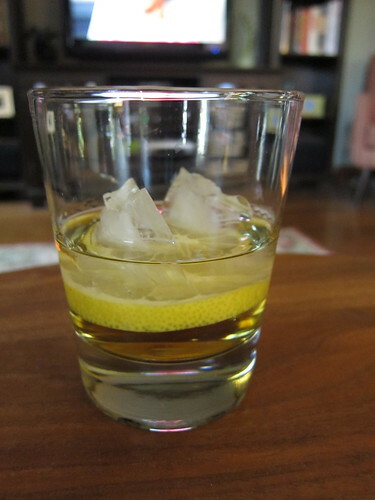 I wished I had noticed this before the Olympics b/c I attempted to do the same thing... enjoy a English beverage while watching the opening ceremonies but I just went with a traditional gin & tonic. Just found your blog today. Very cool!